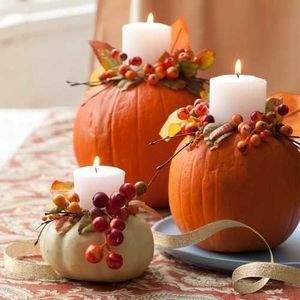 Pumpkins are a staple when it comes to Fall decorating, but finding different ways to incorporate them into our home can sometimes be a little hard. 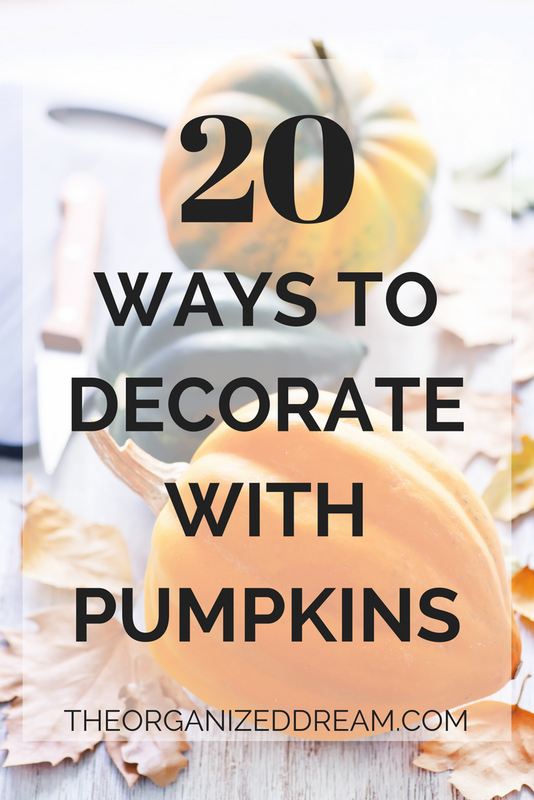 I've brought together 20 different ways you can decorate your home. Enjoy! Using a bit of spray paint can go a long way. This idea comes from FamilyHoliday.net. 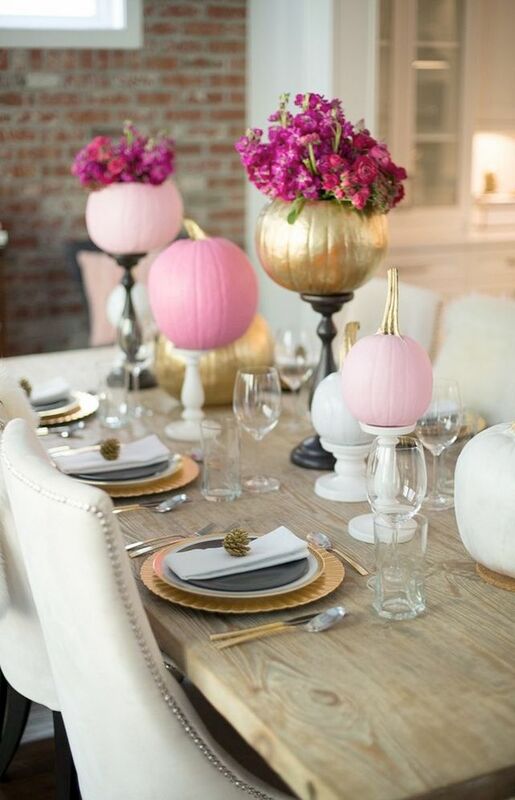 Sticking with the gold idea, this idea from A Pumpkin and A Princess shows you how elegant pumpkins can be when used as a chic dining tablescape. This setting from Thistlewood Farms shows how adding some earthy elements and a bunch of white can create a beautiful look to suit any decor. 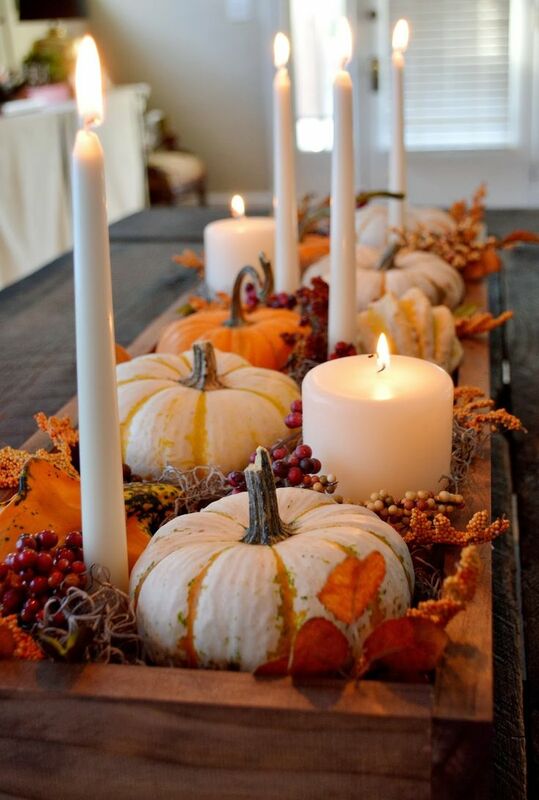 Why not add some color like pops of red from Cranberries and some candles to create a warm, inviting centerpiece like this found at AllYou.com? Here is another tablescape FamilyHoliday.net using white and red. So chic! 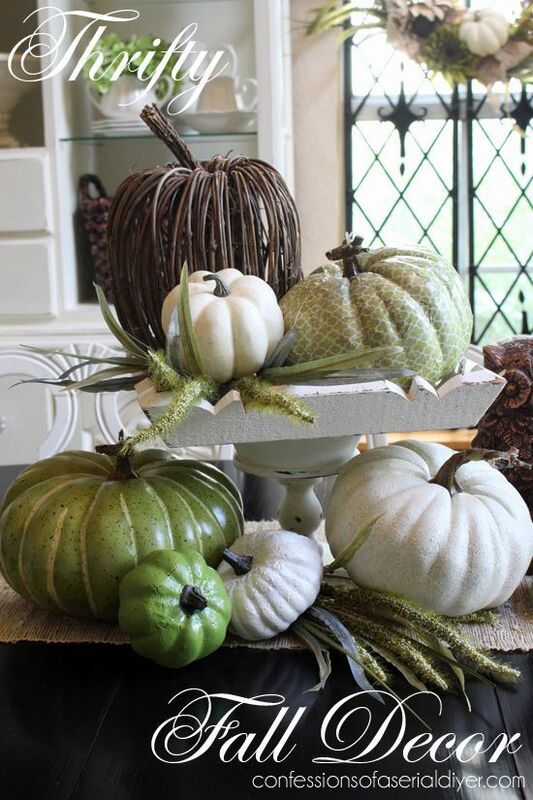 Gourds are another great way to add color and texture to any room from Rainbow Delicous and they look great when tealight candles are added. Having family over for dinner? 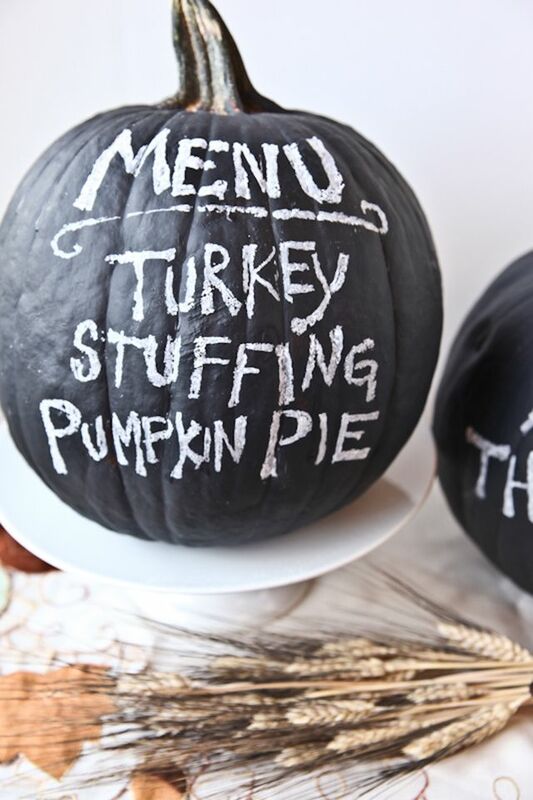 Whether it's for Thanksgiving or just another Sunday get-together, this idea from Entertaining.About.com is a clever way to announce the menu! Get a little girly by adding roses into the mix. This beautiful idea comes from The Fancy Yanceys'. 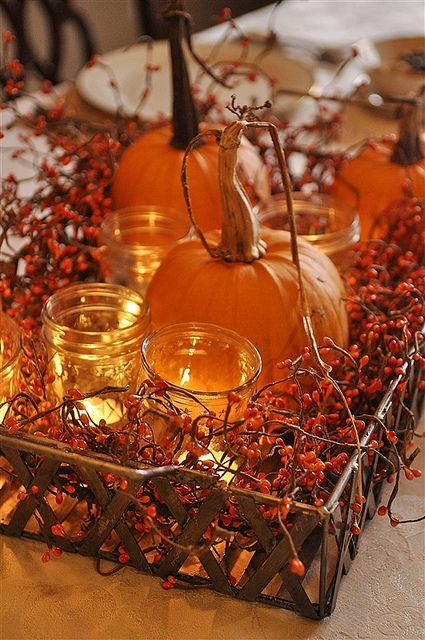 Create this beautiful look by simply adding mason jars, pumpkins and cranberries in a rustic tray! This idea comes from Your HomeBased Mom. Love flowers? 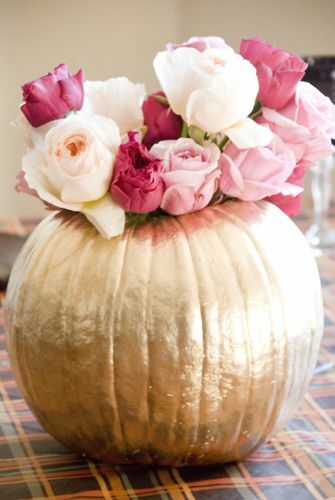 Add a few pumpkins to the water of your vase like this from Lady Lux. 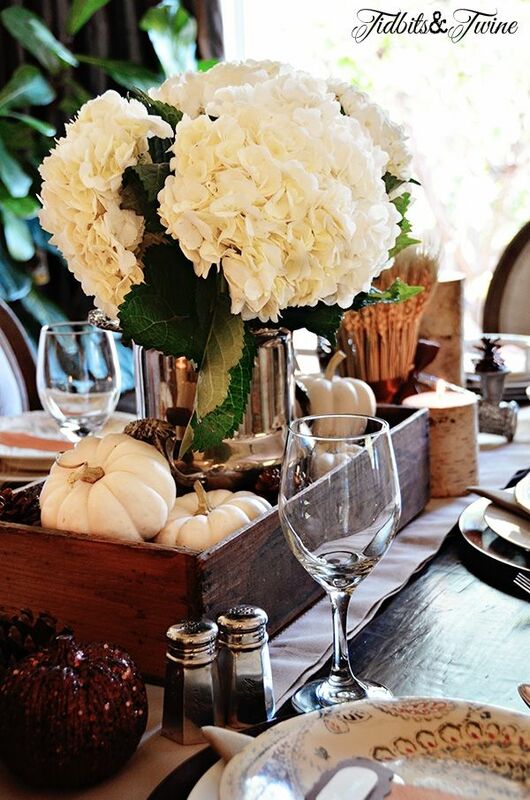 Wooden box, moss, tapered candles, gourds...love! This is a great idea from Livedan330.com. 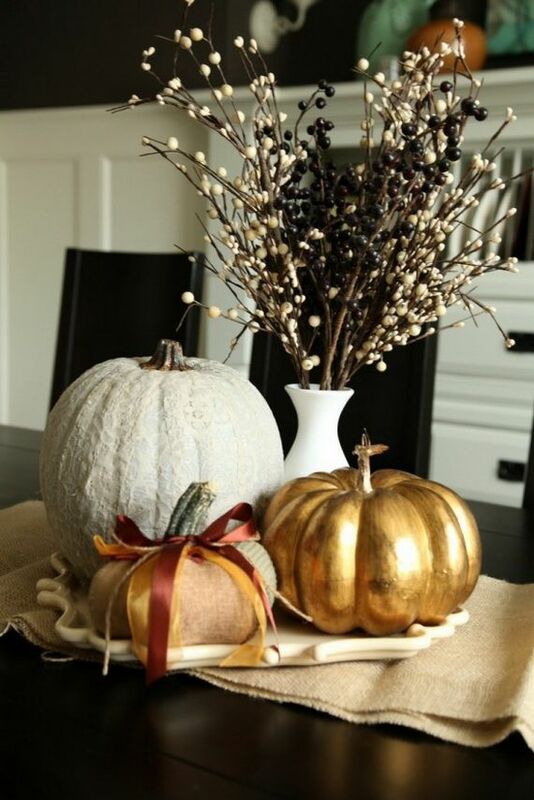 Put your pumpkins on pedestals like these found on Entertaining.About.com by using candle holders to add height! Another box idea from Tidbits and Twine using pinecones, flowers and pretty birch-looking candles! Who ever said you can only paint or carve pumpkins?! 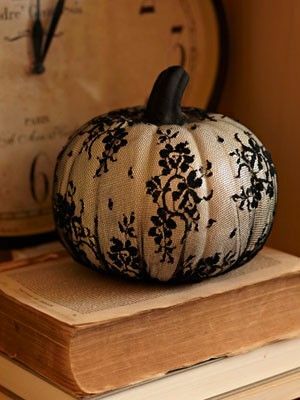 This idea found on Deck The Halls-Christmas shows you how to add a pretty lace stocking over a pumpkin! Not everything here has to be about home decor. 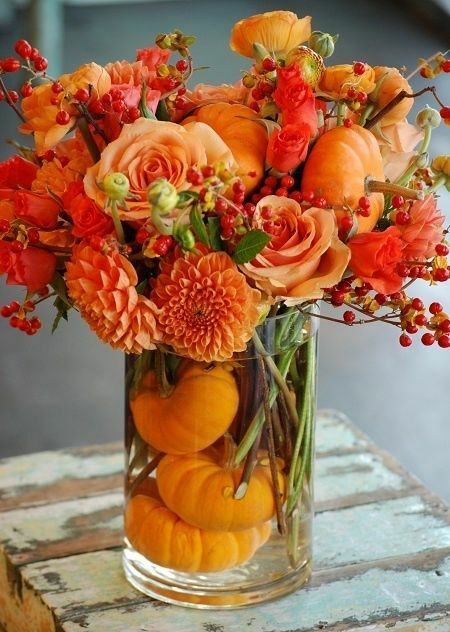 Here's an idea for a Fall wedding from WeddingChicks.com. 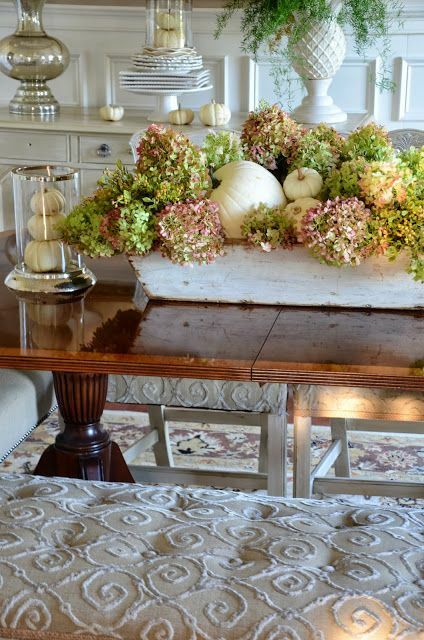 This beautiful rustic decor from Country Living is perfect for a country home! 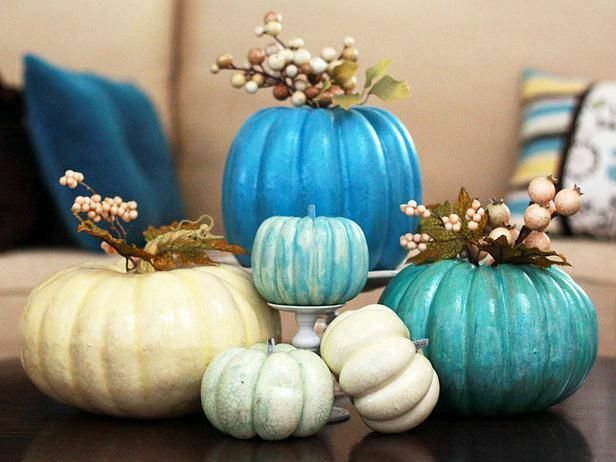 Add some not-so-fall colors into the mix like these pretty blue hues from HGTV. Pretty green and wooden accents make this centerpiece from DejavuEDesigns.com one of my favorites! Spell out a chant or a name and add it to your table for something whimsical and enchanting like this from BHG. Best part? You can spell out anything and keep it all season long! 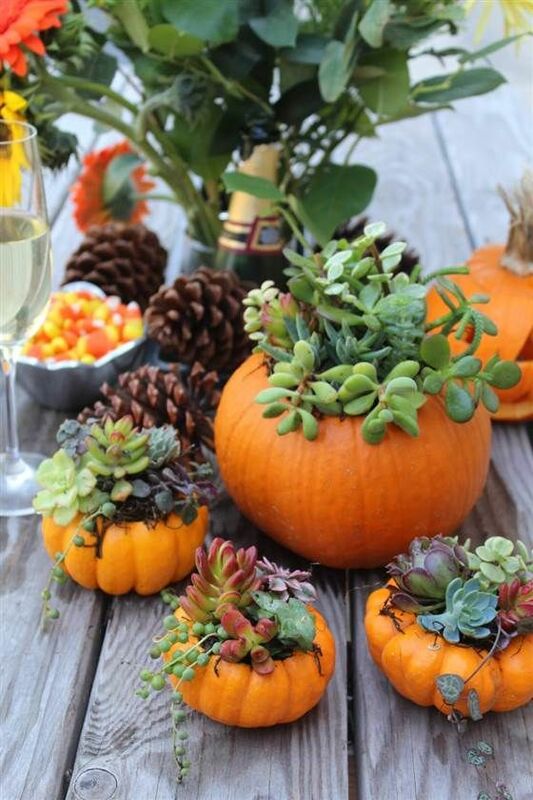 Create a great succulent centerpiece by planting them in pumpkins like these found on Today.com. I hope you've enjoyed my list and found a lot of inspiration! Thanks for stopping by! Great ideas!! Can't wait to work on my table settings! Great ideas! 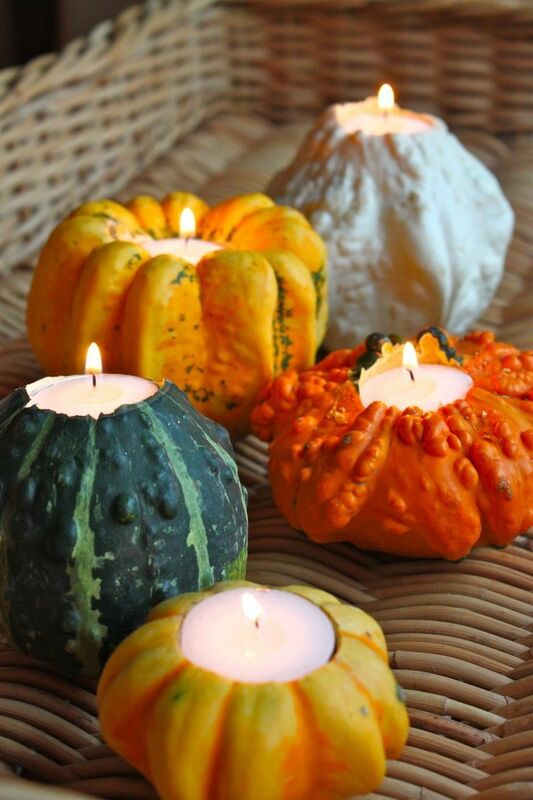 I love the gourd candle holders! 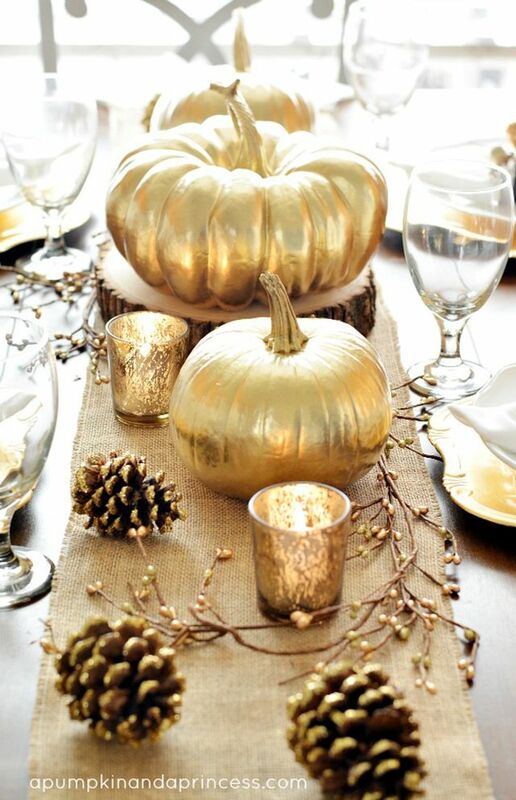 Gotta love those metallic pumpkins! Great roundup! 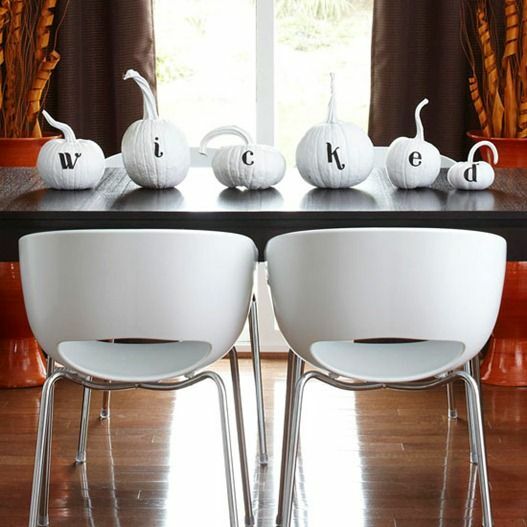 Wonderful pumpkin decorating ideas. I never get tired of pumpkin decorating! Fall is so fun. Thanks for sharing with us at the Merry Monday party. thanks for sharing these! 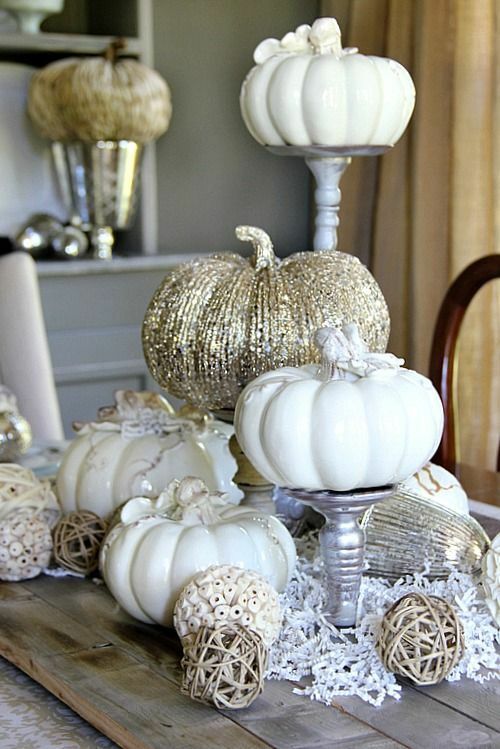 I love pumpkin decor so much! Hi Kate! Wow! Lots of great decorating ideas here. Love it! Thanks for sharing and have a great week! Great collection. I think I need to do some pink for the grand daughter!. I love the succlents too. I'd like to invite you over to link at my blog for The Fabulous Fall Party. 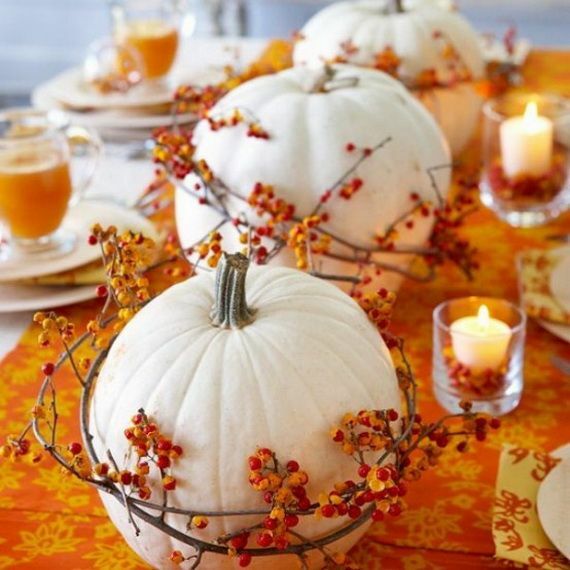 I wish we decorated with pumpkins here in Australia, because they are all such beautiful ideas. I might just have to start my own traditions here and bring some pumpkin to the table! Thanks for linking up with Pin Worthy Wednesday, hope to see you next week! These are all so pretty. I LOVE the ones for growing succulents. I would love to have you post on my blog hop—the Weekend Blog Hop at My Flagstaff Home (www.myflagstaffhome.com). It begins on Thursday evenings and lasts through the weekend, if you're interested. Hi Kate! Thanks so much for linking up your Halloween projects to the Thriving on Thursdays linky parties. They'll be featured tomorrow in a Halloween round up post. Thanks for your support. Such cute ideas! 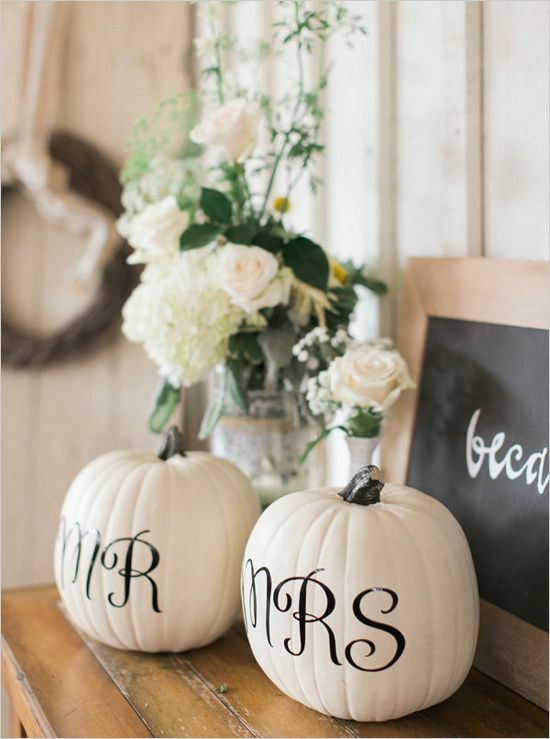 I was JUST pinning inspiration for this exact thing, I am definitely feeling decorating with pumpkins and I love #3! so many great ideas!! Thank you for linking up to the link up party Waste not Wednesday!